On sale now at your favorite online retailer! 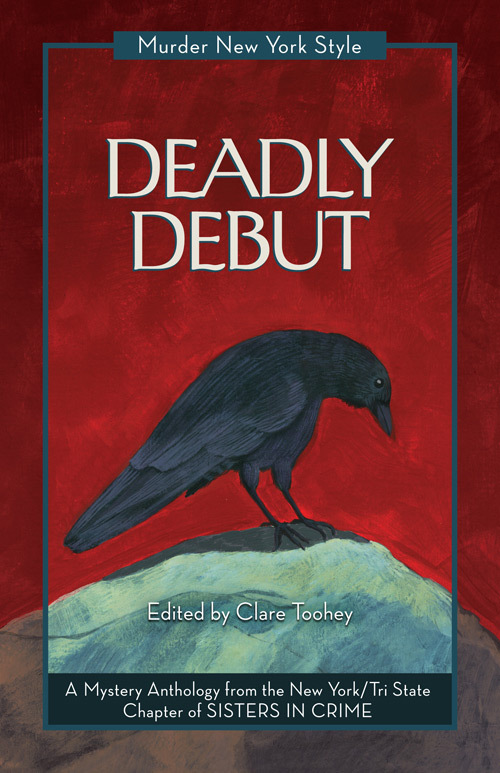 It’s curtains for Gotham in Deadly Debut, the first bow in the Murder New York Style series! From the original edition comes this newly-abridged collection of seven twisted tales that reveal New York City’s dramatic and dark underbelly. In these pages, a Bronx teen steeped in Poe confronts her tormentor; on Manhattan’s Upper East Side, a recovering alcoholic sweeps up deadly secrets (an Agatha Award nominee for Best Short Story); and in post-war Queens, a gutsy lie shatters lives. From a Brooklyn nanny’s street smarts to a small grocer’s grit, from a nightclub’s belly dancers to a P.I. reared on jive, the characters in these crime stories will have you cheering. ON the Saturday morning, when I finally got around to cleaning my apartment, I found a ton of mouse droppings, seven enormous water bugs, and a body. The body lay crumpled like a Raggedy Ann in the back of the walk-in closet. That closet was the jewel in my rent-controlled crown. It made me the envy of all my friends with one-year leases in the overpriced shoeboxes that had replaced most of the old-law tenements and crumbling brownstones on the Upper East Side. The white, working-class neighborhood of Yorkville had fallen prey to developers, who put in high-rises with Sheetrock walls as thin as a corned beef on rye in a greasy spoon. WHEN my father said, “Becka, we have to talk,” I thought I was going to hear yet another installment of the Last Will and Testament. It was the day after Christmas, 1989, and we were sitting in what he called his Florida room, sipping beers and listening to the whirr of the sprinkler system on the golf course outside his West Palm condo. I fought off impatience. At eighty-four, he was entitled to his obsessive concern about leaving his affairs in order. But he didn’t want to discuss codicils. Instead, in the restrained and slightly ironic tone he always used when talking over matters that deeply moved him, he told me about the guilt he’d been living with for forty years, ever since that summer night in Queens in 1949. EVE stepped out of the tent with an elegant Persian walk. The shamadan candles glowed in the darkness, casting shadows on the many faces. Eve glided along, oblivious to the crowd, her wrists drawing graceful circles in the air, her body swaying from side to side, carried by the music. For her, the dance wasn’t an instrument of seduction, but a mystical trance. The music changed to the old Egyptian, country-style beat. Following the rhythm, Eve started a hip-lifting walk. She reached the center of the floor and switched to the ribcage circles and undulations while slowly descending onto her knees. Her entire body snaked under the shamadan as if she were born without bones. Mesmerized, the crowd drank in her every move with the thirst of desert Bedouins. I HARDLY recognized the dejected man sitting on the other side of the Plexiglas screen. The last time I’d seen Eric Nelson, he and my dad were gigging at the Zinc Bar with a saxophone player. Eric had seemed monumental: six feet tall, with ruddy skin and unruly gray hair. The three of them were grooving like it was still the fifties, and Miles Davis—yes, I was named for him—was the invisible fourth member of their combo. THE suspects in question were my students—good kids representing the wide demographic make-up of Westchester County, New York. My classroom was a mix of the traditional landscape—Italian and Jewish families who had migrated north from the Bronx; wealthy, landed families from northern Katonah; and a smattering of African-American kids from neighborhoods in and around our biggest city, White Plains. Add to that a huge influx of Hispanic families climbing their way up through quasi-industrial areas like Port Chester and a sprinkle of Asian families, who all but owned smaller villages like Hartsdale. Then throw people like Donna into the mix, and you got a boatload of Brooklyn from just over the bridge. JOE had a plan for his children’s lives, and it didn’t include following him into the police force. They were going to take their hard-earned college degrees and get jobs that were safer. And better paid. And cleaner. The plan for his argumentative daughter, Ellie, was law school. Now she had just told him she’d be taking her degree in sociology straight to the police academy. EDGAR Allan Poe killed him. That’s not what they wrote in the Journal-American or any of the other New York dailies, of course. Those newspapers got carried away with gang violence and how maybe it was the Fordham Baldies did the deed. The papers called the Baldies the most dangerous gang the Bronx had ever spawned. But Edgar Allan Poe was the one who killed him. I know. I was there. Enjoy these seven crowd-pleasing tales at a wonderful price, and you’ll be calling for an encore!